This is the ninth and final entry in our 2013 Governor’s Awards in the Arts blog series. I hope you have enjoyed reading these interviews as much as I enjoyed conducting them. Thank you for your shares, comments, re-blogs, Tweets and Facebook posts. Each of the nine recipients — whether a business, arts organization or individual — offers a unique perspective on participating in the arts in Kentucky. I am proud to have met each and every one of the individuals who will receive awards during today’s ceremony. Our final interview is with the 2013 Governor’s Awards in the Arts Milner Award recipients. You’ll notice the plural there as this year’s recipients are a married couple, Oakley and Eva Farris of Covington. The Milner Award is considered the most prestigious of the nine Governor’s Awards. It was established in 1977 in honor of B. Hudson Milner, a Louisville utility executive and civic leader, whose contributions to the arts in Kentucky remain important to this day. The Milner Award is presented to Kentucky residents or organizations located in Kentucky for outstanding philanthropic, artistic or other contributions to the arts. Mr. Farris spent his professional life as a traveling salesman — one who never took up driving, I might add. Mrs. Farris, who has a degree in business, supported Mr. Farris as his partner every step of the way. “She gives me a suggestion and I jump,” he said of their professional life together. Schools, arts organizations, civic organizations, museums and libraries are just a few of the types of institutions supported by the Farrises. 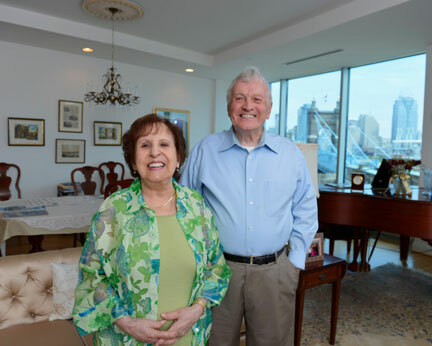 They have generously invested in Northern Kentucky University, The Carnegie Center for the Visual and Performing Arts, and the Behringer-Crawford Museum, to name a few. And isn’t “invested” an interesting way to describe giving? I thought so, too. You’ll not have to read far to learn why. Again, congratulations to all nine recipients of the 2013 Governor’s Awards in the Arts. The awards will be televised on KET and KETKY in the coming month. You can find a schedule at the bottom of this post. How did you come to be philanthropists for the arts? Oakley Farris: We’re not philanthropists. Period. We don’t give money away. We invest in our community, and we expect a return. In my mind’s eye that word denotes some big shot giving his money away and that’s not for us. Tell me about your support for the arts. Oakley Farris: How do you describe art? I dare say the majority of people would think of art like behind you, that beautiful picture. But you know, art comes in many forms. Art can be a book. It can be a good-looking woman with beautiful lines. Or a beat up Coca-Cola bottle or a can. It’s true. That’s part of art. And I’ve said for years art is an integral part of our education system. Unfortunately art has been taken out of many of our schools. Correct me if I’m wrong. Bad news. Bad news. Why do you personally feel making gifts to the arts is important? Eva Farris: I think it’s very important, especially, it’s part of living. You don’t just need material things. You have to look farther. Especially kids, so they grow with some sense of vision. You see the difference in these children when they draw, you see the art in there, the feeling there just to find it, promote it. It’s very important. Is education the most important thing for you to invest in? Oakley Farris: I tell you what, I was such a lousy student. It was the grace of God I got that diploma. It’s just like yesterday, I go up to get the diploma, and the principal was a big tall gentleman. He looked down at me, and I could read his mind, “How did you get up here?” It’s extremely important to me. Personally, I feel like our entire nation is being dumbed down. There are jobs in this country they can’t fill, because they don’t have the citizens well-educated enough to fill those jobs. And that all has to do with art when you think about it. Eva Farris: It makes character in a person, too. …If you don’t have art in an education, for me it’s worthless. It produces more imagination. Oakley Farris: Art unleashes the brain. It stimulates the brain. KET Sunday, Nov. 3 – 2 p.m.
KET Monday, Nov. 4 – 4 a.m.
KETKY Monday, Nov. 4, 7 a.m., 11 p.m.
KETKY Friday, Nov. 8 – 6 a.m., 9 p.m.
KETKY Saturday, Nov. 9 – 8 a.m.
KETKY Monday, Nov. 25 – 4 p.m.
KETKY Thursday, Dec. 5 – 1 a.m.
As a lifelong theater participant and fan, it was exciting to have the opportunity to visit Actors Theatre of Louisville and talk one-on-one with Managing Director Jennifer Bielstein. If you’re not especially familiar with the theater world, let me just say Actors Theatre is the gold standard in the world of regional theater. As a former theater student, I can say with certainty the majority of young people who want to work professionally in theater rank Actors Theatre high on their lists of places they hope to someday work. One of the things I think is really superb is that the theater has a well-respected intern and apprentice company that helps train the next generation of theater professionals. And, of course, I have to give a shoutout to ATL for employing graduates of my former theater program at Morehead State University. It’s worth recognizing when regional theaters with presence on the national scene employ people from their own states. Kudos to ATL for recognizing quality talent in the Commonwealth. This year marks ATL’s 50th anniversary of producing professional theater in Kentucky. While the theater has changed through the years, and continues to evolve, it remains one of the top theaters in the nation and is dedicated to keeping the spotlight on the Commonwealth for years to come. Congratulations to Actors Theatre of Louisville, the 2013 National Award recipient in the Governor’s Awards in the Arts. Give me the rundown of the work and programming produced by Actors Theatre each year. We have multiple streams of programming. We want to, and feel we have a responsibility, to serve a broad range of people in this community. We have our main stage series which is sponsored by Brown Forman. That is a range of plays that are comedies, dramas, sometimes musicals, sometimes classics, sometimes contemporary. We also have some annual shows which are great holiday traditions for people. They bring their friends and families and they come year after year. We do Dracula, which is unusual in regional theater. This is our 19th year of running Dracula. People love it. We do A Christmas Carol and this will be our 38th season of producing A Christmas Carol. That’s a great entry point, often for children, whose families bring them. We see and have heard many stories from people who remember coming here as a kid and now they’re bringing their own children. We do the Humana Festival, and that’s how we’re known nationally and internationally. The Humana Festival is like the Sundance of new plays. We produce six to 10 new plays each year during the Humana Festival. It takes place in March and people come from all over the country and all around the world to see it. This past year we had visitors from almost 10 different countries and from more than 30 different states. How long have you produced the Humana Festival? In 2014, our current season, we’ll present our 38th Humana Festival. One of the reasons we are so honored to receive the National Award in the Governor’s Awards in the Arts is, over our long history of 50 years, we’ve really been a pioneer. We continue to be a leader in our national field of theater. The Humana Festival was the first new play festival that existed amongst regional theaters in this country. Actors Theatre made a bold commitment and has really stood by that commitment and continued to invest in new play development. And that is to impact the canon of American theater that exists, to continue to feed new work into the American theater. We were a pioneer in creating the business models that exist today for theaters and for many arts organizations, the subscription model that really helps to sustain what we do because people commit to a full season and it allows us to produce a range of programming. Whereas, if we were to sell single tickets to each show, it would be a much bigger and challenging marketing investment. How has the theater been a leader on the national scene among regional theaters? 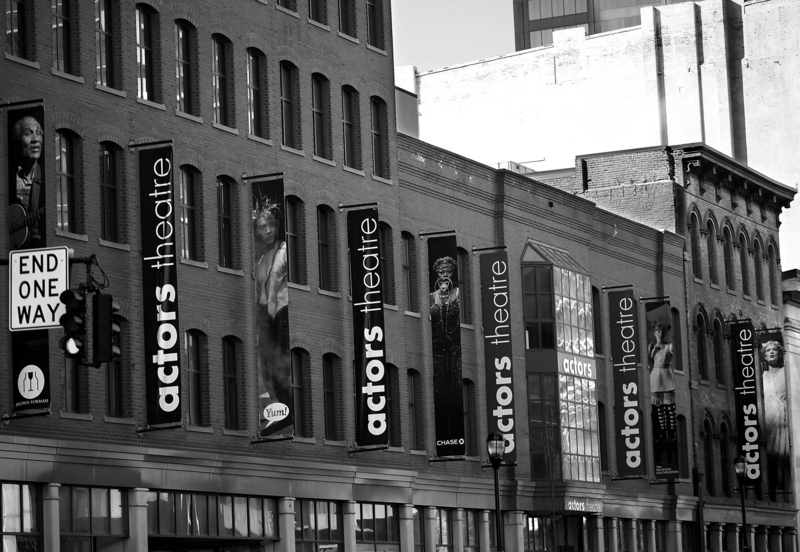 Actors Theatre has been a leader over our history and today amongst regional theaters in new play development. We have hundreds and hundreds of theaters and individuals who come to the Humana Festival each year to see the work we are premiering and to either commit to produce it at their organization, to sign on as an agent for one of the playwrights, or to publish the work. We have produced more than 450 new plays for the American theater. One of our big goals each year is to insure they receive subsequent productions. Our current statistic on that is about 80 percent of them go on to subsequent productions. We think that is very strong. We were actually early in terms of giving access to patrons and donors to our artistic process. We have an open rehearsal process. People can come in and watch rehearsals, whereas many theaters protect that and don’t allow people into the room. We give them access to reading scripts early on in the process. I would say today we are doing some innovative things in terms of technology. One of the things I’m really excited about we started this past year is a series called The Balcony. For people who are really attached to their phones and need to be on Facebook and Twitter, we have opened it up on certain nights where any seat in the balcony you can Tweet and post to Facebook and interact during the whole show. One of the things I thought was so fascinating and delightful about it is that people who have come there to be on social media and interact with the show have said after intermission, “I want to put my phone away because I just want to watch the show.” We’re really willing to test new media, new technology, in terms of what we do. Les Waters, who is our current artistic director, is renowned in the world of theater and is a hugely sought after director, one of the top directors working in the states right now. We’re really excited he is here and working with us. How has Actors Theatre’s location kept Kentucky in the national spotlight over the years and why has that been important to the state? We are thrilled that we are located in Louisville and in the Commonwealth of Kentucky. We get tremendous support in terms of people valuing what we bring to the quality of life and in terms of economic impact to this region. Through the Humana Festival, especially, but through other work, too. We bring great positive attention to the state of Kentucky in terms of truly being one of the best in the country and a leader in the arts in the nation. We also are bringing in the 150 artists we work with each year and employing them in the state. I think they learn a lot about Louisville and Kentucky, and they become ambassadors for this area when they return to their homes. I’m a big believer that if any of the arts organizations thrive, it helps to elevate the entire sector. I do think because of the great support of this community and the state of Kentucky, Actors Theatre has been able to thrive and to remain strong. That helps the entire arts ecology in the state. We do have strong organizations and artists throughout the state. If we all can remain strong it helps the others as well. Before beginning work in state government eight years ago, I was a journalist. I loved my work. I loved talking to strangers, asking questions other people never get to ask, having one-on-one interactions with interesting people. I loved condensing and sharing the knowledge I gained from those interviews and presenting it to a larger audience via the newspaper format. I’ll not lie: I miss it. It was all of those things I miss that led me to conduct interviews with each of the nine recipients of the 2013 Governor’s Awards in the Arts. It’s a project I’ll carry with me for a while. It was an especially exciting prospect to interview a man who has spent his professional life as an interviewer himself. Tom Eblen, current columnist and former managing editor of the Lexington Herald-Leader, is this year’s Media Award recipient. It was great fun sitting down with Tom and learning about his career and lifelong interest in the arts. Tom is originally from Lexington and is a graduate of Western Kentucky University. His journalism career took him to the Associated Press in Tennessee and then to the Atlanta Journal-Constitution where he was a reporter and editor. 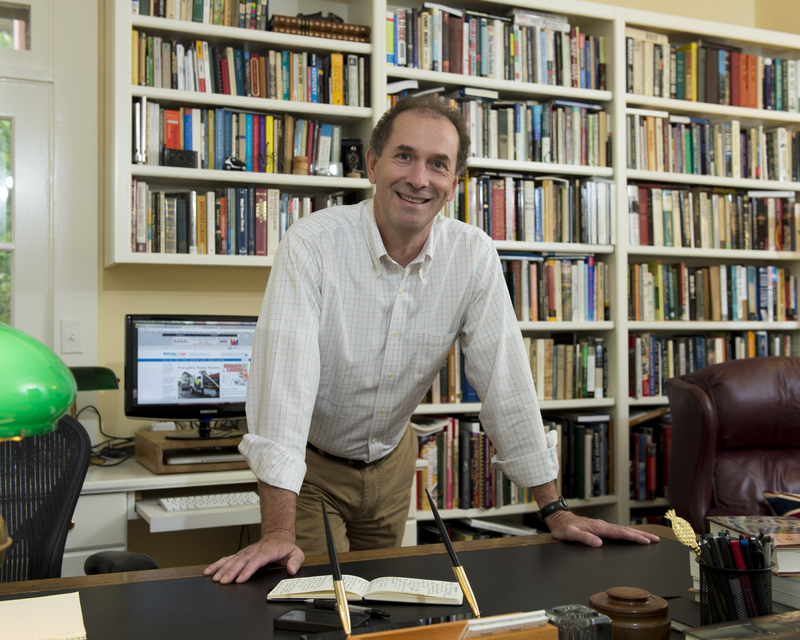 Eventually, he came back to Lexington to work for the Herald-Leader as managing editor for 10 years before settling into the position he holds now as a columnist. I hope you enjoy reading what he had to say when he was on the other side of the interview equation. How would you describe the kind of work you do in relation to the arts? The columns I write tend to be about local and state issues. They tell good stories about interesting people. The kinds of things I like to look at are what is interesting, what makes Kentucky unique. But also, what does Kentucky need to be doing to position itself well for the future? We have such a rich history in this state. How do we leverage that to become a more successful state? And a big part of that has been arts coverage. Part of it is just because it’s something I’m interested in and have always been interested in. I’ve always had a lot of friends who were artists and writers and I liked their work. I think the arts in Kentucky are so important, because what they really are, are expressions of creativity. It’s really central to the thinking process, and to success, to be able to look at the creative process. The arts are such a great expression of that. You see it all over Kentucky. When did you first become interested in arts as subject matter? I’ve always been interested in the arts. My first cousin is an artist and his father was a well-known artist. I kind of grew up around it. I always liked to draw and liked art. I always had an interest in the arts and as a journalist I’ve always been interested in writing. In this job I try to write about what I think is interesting and what other people will think is interesting. When you talk with someone, when you want to write a story, do you have specifics in mind or do you just want to learn about them? I just want to know what their story is. As most people know a columnist is a storyteller. Having been a reporter for a dozen years, then an editor for 20-something years, I know what’s going to make an interesting story. Also, a lot of my best column ideas come from readers. Generally what I have done with artists is, if their work really intrigues me I figure their story will too. Most artists are really interesting people. A lot of them have very interesting stories about how they became artists and the thoughts behind their work. People who are driven to create art are driven by something. And that something is usually very interesting or they have a good story behind it. How often are you thinking about your readers when you are writing? I’m always thinking when I’m writing, what’s going to interest the reader? What’s going to grab them in and make them read all of the way to the end? The easiest thing for a reader to do is to stop reading. How can I answer the questions that will come to their mind when they’re reading and look for the things they’ll want to know about? Why is it important for a newspaper to include the arts in their coverage? Well I think one of the things newspapers are supposed to be is a reflection of their community and community life. In most vibrant communities, the arts are a really important part of it. It’s where a lot of segments of a community come together because of a common interest. My wife does a lot of volunteer work for the UK Opera Theatre and through that we’ve met a lot of people from all professions. Do newspapers play a role in arts advocacy? Editorials and columnists, I think they do. Newspapers are always careful about advocacy but I think generally they do. Part of that is explaining to people, especially in tight budget times when there are a lot of life and death issues going on, things like the arts are still important for quality of life. They’re an important part of what a rich community in this state is all about. What makes Kentucky artists special, different, unique – part of our culture and heritage? Kentucky has always been a place in transition. In the early days we were the frontier, and then we were the west, and then we were a border state. Then, in many ways, things were going on all around us and we were our own little island. Now as the economy is changing we’re kind of in the middle of the country. It’s always been a society in transition, a society in mobility. It’s also been a society that people have always been very proud of where they come from. Plus, we have a lot of very distinct regions and those regions produce a lot of different kinds of art. I think the bottom line is it comes down to a sense of place. I don’t know many Kentucky artists or writers who don’t have a sense of place at the core of their work. You look at almost all Kentucky writers, and artists are the same way, the colors and the inspiration they get from the state really makes a difference in their art. If you’ve never visited the Kentucky Artisan Center at Berea, take my advice: Finish reading this blog post, then hop in your car and head on over. You will like what you find. 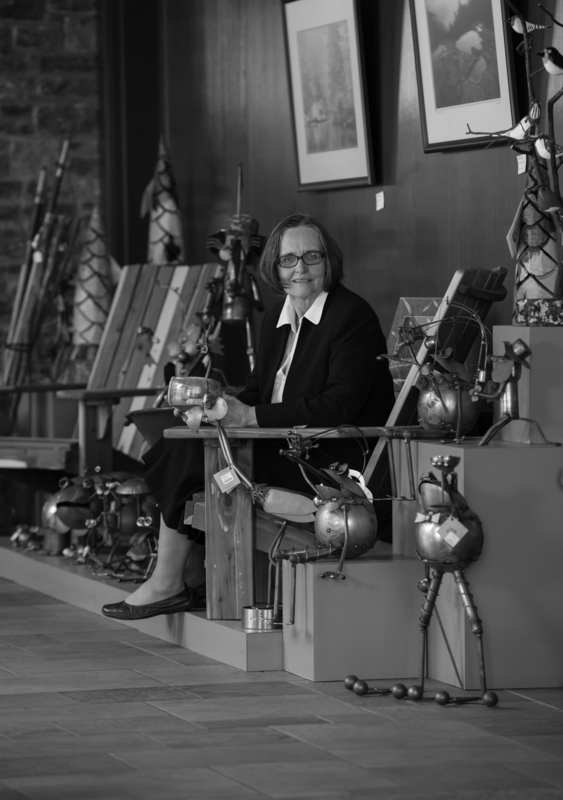 The Kentucky Artisan Center at Berea has been an economic oasis for Kentucky arts businesses of all sizes since it opened its doors in 2003. Ten years later, the artisan center now introduces travelers up and down the I-75 corridor to the wonderful world of Kentucky artists, musicians, writers and food producers. The artisan center also provides a unique experience for those of us who call Kentucky home. The Kentucky Artisan Center at Berea is the 2013 Governor’s Awards in the Arts Government Award recipient. I felt very fortunate to spend some time with Victoria Faoro, the center’s executive director since the day it opened its doors. For people who have never visited before, describe the Kentucky Artisan Center at Berea. The Kentucky Artisan Center is really a taste of Kentucky. It’s meant to be a gateway to the entire state, so it includes all Kentucky-made products. We have visual arts, crafts, 2-dimensional art, music, books, and specialty food products. What’s unusual about the artisan center is it does have a dual focus. It’s meant to introduce people to the arts, but also we send people to other places in the state, so we’re promoting travel in Kentucky as well. We offer a café that serves many Kentucky specialties. We offer traveler services. We are, in fact, the only mid-state rest area on I-75. The artisan center is a place you can get a feel for the quality experiences you can have in Kentucky, and we provide you with information to explore those experiences further. How many Kentucky artists and artisan businesses are represented in the artisan center? We work directly with more than 700 artists all across state. We also buy works from musicians and writers that we purchase through distributers, so we work with even more Kentucky artists that way. We try to work with each business at the level they are on and provide the kind of support they need, that will be helpful for them. We’re really willing to work with them. We feel their success in business is the most important thing. We work with them on packaging. We’ll work with them on things like quantities. We’ll work with them on price points and presentation that will help them and, often I think, it helps them in other places too. How is the assistance you provide to artists beneficial to them? A lot of times it can help them avoid some costly mistakes. If an artist is testing a new item they have a chance to try it in a small way, with someone who is not going to stop carrying them if it doesn’t work out. A lot of times we’re the first wholesale customer a Kentucky artist will work with. It gives them a little experience before they go to their first wholesale market or show. The artisan center offers Kentucky artists an easy stepping stone to working with other wholesalers. How is the artisan center different from other state government agencies? The first thing I would say is, in order to balance our budget, we have to generate over 70 percent of that through sales. Conducting business efficiently and effectively is extremely important, especially when you realize the travel service section doesn’t earn any revenue. I think we’re unusual in the fact that the majority of our space is public and our staff is working seven days a week, nine hours a day with the public. It’s also probably unusual for a state agency with a budget this size to be working with as many vendors as we are. Can you talk about how the artisan center is important to introducing people to Kentucky and to our artists? As the board and the planning groups were thinking about the center, they began to envision it as a billboard on the interstate. They really thought of the front of the building, what it would look like, and worked to make it something that would make people want to get off the interstate. The limestone in the building is Kentucky limestone. The stonemasons who laid it were all Kentucky stonemasons. I sort of feel like from the minute a person sees the building and comes inside, they’re seeing Kentucky as a place of quality. I think the main thing we can do is give people the sense that Kentucky has quality businesses and quality experiences. When people come to the center they’re expecting a typical rest stop and I think they’re very surprised and happy when they find the center full of all kinds of art. We do try to have a range of price points such that any person coming in could afford to get something if they wanted to. We use the products in fun ways so people can enjoy the art. A lot of times we have people say, “I didn’t have any idea Kentucky had these things or these places to visit. I’m going to plan more time here for my next visit.” For us, that’s a measure of success if people want to come back and spend more time in Kentucky. Why is it important for the artisan center, as part of state government, to support artists economically, to provide economic opportunities for our artists; especially in conserving our arts and cultural heritage? Kentucky is very fortunate to have a very vital and flourishing artist population. There are many arts still being made in Kentucky that just aren’t in other places. They’ve died out totally. During difficult economic times, a lot of artists were finding it difficult to continue making their art. Many artists found themselves having to consider quitting altogether because they didn’t have any assurances of income. One of the things we can provide as a center that has the visitation we have is some assurance of continued sales over a period of time. Many artists have said that, the fact that we order from them several times a year and we can be counted on to pay for our orders in a prompt way enables them to purchase the materials they need to continue making their art. We just think the arts are really important, not just for visitors, but for the people in the communities where these artists live. The quality of life is just better everywhere if our artists can continue to make work. We see it in people who come here. There’s something really wonderful about being able to purchase and make a part of your life something that’s connected with a community or an individual. Meeting River City Drum Corps Founder Ed White, of Louisville, was one of the best experiences I had while interviewing the 2013 Governor’s Awards in the Arts recipients. I was energized for weeks after my conversation with Ed and kept referring back to my interview with him to reread some of the wisdom he shared with me. Ed grew up in Louisville’s west end. As a child he was drawn to the arts but did not have ample opportunity for participation. Due to his involvement with a local Boys Club, he was naturally exposed to sports and played for years, even though his heart wasn’t in it. Ed eventually ended up being a director at a Boys Club and found it was still a sports-focused atmosphere. He decided it was time to incorporate the arts into the system, making art available at the same level as sports. During the next few years, with opportunities to learn through programs like Arts Reach Kentucky, Ed developed the tools he needed to start the River City Drum Corps. I talked to Ed for more than two hours the day we met. I think if he hadn’t had other things to do, I’d still be there talking with him. What you will read in this interview about the drum corp barely makes a dent in Ed’s personal story and experiences. It is without pretense I say: Ed White, the 2013 Governor’s Awards in the Arts Folk Heritage Award recipient, makes me proud to be a Kentuckian. What is the process like when kids sign up for the River City Drum Corps? What do they learn? The first thing they learn is discipline. The first thing I have to do is get them to be able to stand still before I can teach them anything. After they get over that learning curve, we deal in drum making. Usually you have to be in drum corps a year before you get to make your drum. Then we start talking about African history and culture. We have a culture class every other Saturday, which is mandatory for them to come and to learn history, to learn culture, to learn games to let them understand the value of the team concept. It’s not a team concept where we have super stars, where everybody doesn’t get to play. It’s a concept where everybody is a part of the process and you rise through grasping the process. Our method is, we use the students as teachers. So we’re constantly teaching, I call it teaching down. As you teach down, the children grow up. And as they grow up, they’re continually teaching down. So the process keeps continually revolving around the idea, so that each child has ownership. It’s leadership development. It’s a leadership development program using arts and culture. They become the show managers, they become the booking agents – it’s the process of teaching them how the drum corps works. Basically, all I do now is just drive them – some shows I don’t even go in the building – so that they understand and they grasp the concept of the energy and power they have within themselves. Why is it important to make your own drums instead of purchase drums? It connects you to the culture. The drum in Africa is the foundation of culture. Celebrations, births, deaths, weddings, war, planting, harvest season. The drum is the foundation of life, ceremonies and culture. When I was in Ghana, I went to Tamale to meet with this group called the Tamale Youth Group. They do the same thing I do with the drums. They use it to teach children as a foundation, so their culture doesn’t get lost because of the influences of Western society. So they teach children to make drums, but also they teach them the purpose of the drum – they teach them to make fabric, to tie-dye – the whole thing about their culture, with the drum as the foundation of it. When you make things you tap into the creative spirit. So when a child takes raw materials and fashions this drum, then their spirit is connected to it. Again, that’s the power of art. The power of art is the connection of your spirit to whatever image you create. That’s what that’s about; that’s the reasoning, why. Once they do it, ownership is created. Tell me a little about the kids who are in the drum corps. I have children from all over the city, from all socioeconomic backgrounds. You know you hear people say ‘at-risk.’ But everybody’s at-risk, because all of us are one or two paychecks away from being out on the street. The gamut runs large and very diverse on the backgrounds of children that I get. Everybody’s looking for something and this is something that they find. Because they are able to participate in the River City Drum Corps, what opportunities are available to them that weren’t available to you? You talked earlier about how the emphasis was on sports, but your heart was in the arts. Was it important to you to create those opportunities you didn’t have? Yes. See, I couldn’t afford drumming. That was something I knew I couldn’t do, but it was easy for sports. Buying instruments was something that would not happen. But my mother could take her children to the Boys Club and everybody would get something. There are so many things we do that get our children out of our community, so they see different things, they see different people. They understand it’s a different world out here. Can you reflect on how the River City Drum Corps has been important to you personally? What personal achievements have you experienced? When children that the world said “they can’t make it,” make it. I look at my children who are first-generation college graduates. I look at them who have gone to school for free. I look at a young man who was from a family of superstar athletes. I see families who understand the power of education and drive their children to succeed, to grab it. I’m glad that I met Bob Gates (former state folklorist). Bob Gates was one of the few people that I know who understands the power of culture. And he understands it. If we could get more people to understand the power of culture we could solve a whole lot of problems. This work for me is my purpose. I’ve done a whole lot of things. I was a welder. I rebuilt cars. I worked in the atomic energy plant reprocessing uranium to build bombs. I’ve done several other little loose jobs. All of the rest of them, with the exception of maybe photography, was without purpose. This is my purpose.